In 1957, Willy Brandt becomes Governing Mayor of Berlin and consequently the internationally known spokesman of his city. In the Berlin Crisis from 1958 to 1962, he plays a significant role in assuring that the West does not give in to Soviet threats and that West Berlin remains free. Brandt cannot prevent the 1961 construction of the Wall, whose brutal consequences he attempts to alleviate with a “policy of small steps.” In 1964, Brandt assumes the chairmanship of the SPD in West Germany. Slandered by right-wing opponents, however, he is unsuccessful as chancellor candidate in the Bundestag elections of 1961 and 1965. 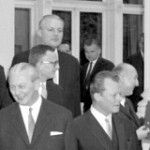 With the formation of the Grand Coalition in late 1966, Brandt goes to Bonn. In early 1957, the right-wing “Berliner Montagsecho” begins a more than six-month long campaign against Willy Brandt. The newspaper scrutinises his change of name and his activities during his exile. Further articles assert that he had taken up weapons and fought for the communist international brigade during the Spanish Civil War and shot at German soldiers while wearing a Norwegian uniform. 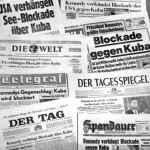 Brandt defends himself with corrections and files a complaint against the licence holder of the paper, Hermann Fischer. In June 1958, Berlin’s regional court rules that Fischer must cease his false accusations and print a retraction. However, right-wing elements and the GDR state security service (Stasi) continue to do everything they can in subsequent years to vilify Brandt. On 6 February 1957, the Bundestag in Bonn debates a proposal submitted jointly by the SPD, FDP and GB/BHE on “capital city Berlin.” Willy Brandt states the reasons for the draft for the SPD fraction. He interprets the commitment to Berlin as capital city to be a clear signal that the Federal Republic intends to work with determination toward German unity. The Berlin representative demands more frequent meetings of the Bundestag on the shores of the Spree and the relocation of Federal Departments to the city. With only four opposing votes, the Bundestag resolves that Berlin is the capital city of Germany and that plans for a parliament building in Berlin shall begin immediately. 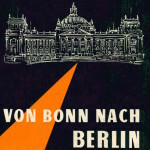 In late 1957, Brandt publishes the book, “From Bonn to Berlin”, in which he documents the discussion on the capital city issue since 1949. 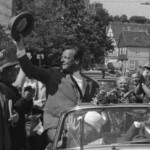 In spring 1957, Willy Brandt undergoes several weeks of medical treatment in the Black Forest town of Höchenschwand. Caused by professional stress and an unhealthy lifestyle, he suffers from heart palpitations and sleep disorders. But in the long run, the chain smoker is not successful at giving up nicotine entirely. Alongside large numbers of cigarettes, Brandt also smokes a pipe which he replaces with cigarillos in the mid-sixties. Not until his late years does he noticeably reduce his cigarette consumption. 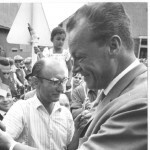 On 11/12 May 1957, at the first meeting of the 14th regional party convention of Berlin’s SPD in Britz, Willy Brandt is elected again to be one of the deputy regional chairs. With 196 of 273 votes, his election result is better than that of his constant rival, Franz Neumann. Only 187 delegates vote for the regional SPD chairman. The second meeting of the party convention on 22 June 1957 is dominated by the upcoming campaign for the Bundestag. 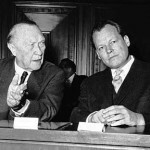 In his presentation, “Berlin’s task and the 3rd German Bundestag,” Willy Brandt sharply attacks Federal Chancellor Konrad Adenauer, whom he accuses of having limped behind international developments for years. In addition, Brandt calls for reflection about the “Day of German Unity.” That day, the 17th of June, should not merely be a day for additional excursions and trips to the swimming pool. After a serious illness, the Governing Mayor of Berlin, Otto Suhr (SPD), dies on 30 August 1957. 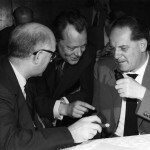 The SPD’s regional chairman, Franz Neumann, attempts to prevent Willy Brandt from becoming Suhr’s successor and again broaches the issue of his allegedly unexplained past. 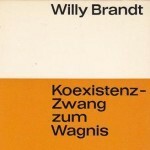 But Berlin’s newspapers, most of all the newspapers of Springer Publishing Company, support Brandt for the most part. Neumann searches nationwide for a counter candidate, but only the SPD Bundestag representative, Adolf Arndt, seems willing to be put on the ballot. Meanwhile, the regional committee of Berlin’s SPD decides on 20 September 1957, by a clear majority, that it wants no other candidate than Brandt. Ten days later, he is nominated at the regional convention to run for Governing Mayor. In the elections to the 3rd German Bundestag on 15 September 1957, the CDU/CSU under Federal Chancellor, Konrad Adenauer, obtains an absolute majority with 50.2% of votes and, with that, its historically best result. Despite slight gains, the SPD, with its chief candidate, Erich Ollenhauer, is soundly defeated and receives only 31.8%. Willy Brandt is no longer a member of the new Bundestag. However, from Berlin he supports the forces in the SPD who, after this serious defeat, are pushing for party reforms. 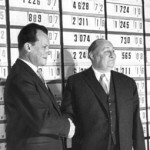 Brandt especially welcomes the news that, in early November 1957, the SPD Bundestag fraction elects Carlo Schmid, Fritz Erler and Herbert Wehner as deputy chairmen. Thereby, the power of party and fraction chief Ollenhauer is seriously curtailed. On 3 October 1957, Willy Brandt is elected Governing Mayor by Berlin’s House of Representatives with 86 to 10 votes. In his first government policy statement, which he delivers 14 days later, he promises to consistently continue the policy of incorporating West Berlin into the Federal Republic. At the same time, the 43-year-old calls for the re-unification of Germany in peace and freedom. But Brandt also emphasises the Senate’s willingness to facilitate the lives of the people in the divided city through technical agreements between West and East Berlin officials. His arch rival, Franz Neumann, has now definitively lost the years-long power struggle. At the regional party convention on 12 January 1958, Brandt wins the chairmanship of Berlin’s SPD with 163 to 124 votes. In early November 1957, an intelligence service report startles Willy Brandt. According to its content, the SED regime is planning measures to cordon off the border soon to prevent GDR refugees and East Berliners with jobs in the West from crossing into West Berlin. As early as mid-October, in the course of a currency devaluation in the GDR, there were already stricter controls at the sector borders and interruptions of underground and commuter train connections. For weeks, the traffic from and to Berlin is also seriously hindered. On 8 November 1957, in a Neue Ruhr Zeitung (NRZ) interview, the Governing Mayor openly expresses his concern about the plans of the GDR government. “Pankow” wants to destroy, Brandt warns, “the function of Berlin as a bridge between West and East.” However, he thinks that an impenetrable “Wall of China” through Berlin will be impossible. On 10 January 1958. Willy Brandt travels to the headquarters of the Soviet city commandant, Andrei Chamov, in Berlin-Karlshorst. With that, he is returning the latter’s visit to Schöneberg Town Hall in October 1957. Actually, the two-hour discussion in Karlshorst yields no concrete results. However, Brandt leaves the meeting in the best of moods – not least of all due to the abundantly served vodka, as the West-Berlin press reports on the following day. The Governing Mayor refutes criticisms of the meeting. He would like to continue the dialogue and hopes for an easing of tensions with the Soviets. For that reason, as Brandt stresses in a speech on 17 January 1958, the Federal Republic must develop an “Ostpolitik” in correlation with its integration into the West and in close consultations with its western friends. 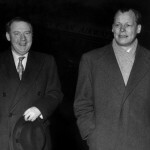 On 6 February 1958, Willy Brandt departs from Tempelhof Airport on a two-week trip to America, His inaugural visit as Governing Mayor takes him to Philadelphia, Washington DC, New York and Boston. 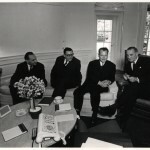 Among others, Brandt meets President Eisenhower, Vice President Nixon, Secretary of State Dulles and numerous senators. Among his more than 50 public appearances is a 30-minute television interview. In Germany as well, the media report extensively on the trip. 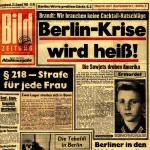 For the “Bild” newspaper, Brandt writes a “Diary of my USA Trip.” His conclusion: The USA stands firmly with West Berlin. A statement by the US Secretary of State impresses him in particular. Americans and Soviets, according to John Foster Dulles, are of the same mind on one point: a re-united Germany must not be neutral. 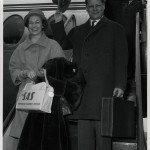 From 9 until 15 March, Governing Mayor Willy Brandt visits Great Britain. In London, he speaks with the conservative Prime Minister, Harold Macmillan, as well as with the chief of the opposition Labour Party, Hugh Gaitskell. Neither politician is counting on Soviet concessions with regard to Germany in the foreseeable future. Brandt discusses with Gaitskell the idea of a troop withdrawal (“disengagement”) by both super powers from Central Europe. Consequently, the Governing Mayor stresses that a “disengagement” ought not to begin in Berlin and that the three western powers must definitely remain in the city. In a speech before the “Royal Institute for Foreign Affairs,” he precludes a separate solution of the Berlin problem before the re-unification of Germany. 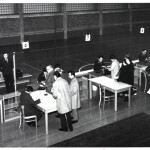 At their regional convention on 19 April 1958, Berlin’s social democrats express their opposition to holding a public opinion poll in West Berlin on the Adenauer government’s plans to equip the federal army with atomic weapons. Led by Willy Brandt, they distance themselves from the national party. In March 1958, the SPD in Bonn co-founded the committee “Combat Atomic Death” and submitted a legal proposal for a public opinion poll. In reality, Brandt is also decidedly opposed to equipping the federal army with atomic weapons, but he does not wish to advocate a public opinion poll in West Berlin. As he explains to party chief Ollenhauer, otherwise the SPD could be accused of making common cause with the SED. The Governing Mayor also warns against blanket criticism of western security policy. 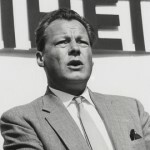 At the SPD’s national convention in Stuttgart from 18 to 23 May 1958, Willy Brandt finally makes the leap into the expanded party leadership structure. In the executive committee elections, Berlin’s Governing Mayor and regional party chairman receives 268 of 383 possible votes. Along with Brandt, Helmut Schmidt, Alex Möller and Gustav Heinemann also move into the SPD’s executive committee for the first time. Herbert Wehner and Waldemar von Knoeringen are elected deputy chairmen. 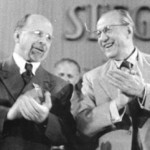 The party convention in Stuttgart is characterised by resolutions for an organisational reform of the SPD and for the development of a new programme of fundamentals which Brandt also advocates in his speech to the delegates on 20 May 1958. 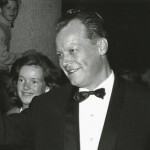 Accompanied by his wife Rut and his daughter Ninja, Governing Mayor Willy Brandt opens the VIIIth International Berlin Film Festival on 27 June 1958. Since 1951, the festival has taken place in West Berlin, and this time the guest list is more international than ever. Among the stars of the festival are Gina Lollobrigida, Walt Disney, Sydney Poitier and Ingmar Bergman. In his opening address, Brandt warns Berliners against pettiness and emphasises the openness of the city to the world. For the first time, after years of hesitation, the directors of the Berlinale also invited the Soviet Union to participate in the competition. But Moscow declines. At the Vth SED party convention in East Berlin from 10 until 16 July 1958, Walter Ulbricht claims that the socialist development in the GDR is complete and boastfully promises to surpass the Federal Republic economically by 1961. Simultaneously, the SED chief expresses sharp criticism of the Senate in West Berlin and of the presence of western troops there. During his vacation in Norway, Willy Brandt admits in interviews that Ulbricht’s position is firmer than ever and that one must count on more rather than less confrontation in Berlin. In mid-June 1958, the GDR had already rejected, as expected, a catalogue of issues on possible forms of relief submitted on behalf of the Governing Mayor to the East Berlin administration. Both sides are again only practicing polemics. Since 1949, more than two million Germans have already come from the GDR to the Federal Republic and to West Berlin. In summer 1958, the number of refugees increases again. The cause of this “voting with their feet” are the political repression and the dismal economic situation in the GDR as well as the steadily increasing prosperity in the West. The majority of the mostly well-educated people take advantage of the open sector borders in Berlin to flee. On 4 September 1958, in a declaration by the Senate to Berlin’s House of Representatives, Governing Mayor Willy Brandt draws attention to the misery of their compatriots. He urgently admonishes the Soviet Union to adhere to accords already in effect on Berlin and Germany and to bring the communist regime in the GDR to reason. 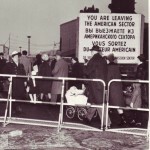 On 27 November 1958, the Soviet Union demands the withdrawal of troops from the USA, Great Britain and France stationed in West Berlin within six months. West Berlin should then be transformed into a “demilitarised free city.” Failing this, the Soviet party chief, Nikita Khrushchev, warns, the Soviet Union will no longer recognise the rights of the three western powers in Berlin and over Germany as a whole. In a five-point declaration, Willy Brandt immediately rejects the demands and the ultimatum. According to the Governing Mayor, the goal of communist policy is “to incorporate all of Berlin into the so-called ‘GDR’.” However, Brandt trusts that the western powers will not leave the city and the adherence of West Berlin to the Federal Republic will be maintained. As a result of the Soviet ultimatum, the election to the House of Representatives in West Berlin on 7 December 1958 occurs under the spell of the new Berlin Crisis. With 52.6% of votes, the clear victor is the SPD under Governing Mayor Willy Brandt. Despite this absolute majority, he continues the coalition with the CDU, which received 37% of votes. The other parties, among them the SED, fail to clear the 5% hurdle. The election makes one thing clear: The West Berliners will not allow themselves to be intimidated by Khrushchev’s threats. On 14 December 1958, Brandt brings this message, and the appeal not to give in to the Soviets, to the NATO foreign ministers in Paris. Of course, his unrelenting attitude and his efforts toward the greatest possible degree of unity with the West, especially with the government of Adenauer, encounter criticism in the national SPD. 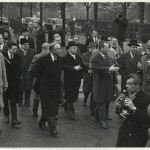 On 6 February 1959, Willy Brandt departs on a widely observed tour around the world. Generously supported by the federal government, the Governing Mayor speaks up internationally for a West Berlin threatened by the Khrushchev Ultimatum. After North American stops in Ottawa, Washington D. C., New York, Springfield and Los Angeles, Brandt flies on via Hawaii to Asia. There he visits, among other places, Tokyo, Bangkok, Colombo, Karachi, Calcutta and New Delhi. During the trip, Brandt’s most prominent interlocutors are US President Eisenhower, UN General Secretary Hammarskjöld, the Japanese Emperor Hirohito and the Indian Prime Minister Nehru. 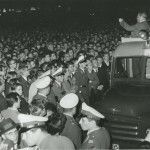 On his return on 6 March 1959, he is enthusiastically greeted at Tempelhof Airport by thousands of Berliners. 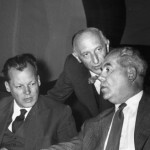 Recently back from his world tour, on 9 March 1959, Willy Brandt receives an unexpected invitation to a discussion with the Soviet party chief, Nikita Khrushchev. It is supposed to take place the following day in East Berlin. 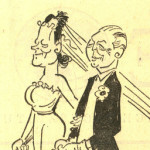 The Governing Mayor is uncertain whether he should accept the invitation, which he – contrary to the depiction of his friend Bruno Kreisky – has not requested. The inconclusive conversation of SPD chairman, Erich Ollenhauer, with Khrushchev on 9 March does not have an encouraging effect. If at all, then Brandt wishes to speak with the Kremlin boss only with the agreement of Bonn and the three western powers. 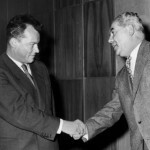 While the federal government does not try to dissuade him, the American ambassador in Berlin speaks adamantly against a meeting with Khrushchev. As a result, Brandt calls it off. Willy Brandt campaigns for support of West Berlin with European partners as well. In January 1959, he has already spoken to the European Council in Strasburg. From 13 to 15 April 1959, the Governing Mayor is a guest in the Netherlands, where he visits Amsterdam, Rotterdam, Utrecht and The Hague. On 18/19 April, Brandt has discussions with the prime ministers of Sweden, Norway and Denmark as well as with social democrat friends from all over Europe. The focal point of his visit in London from 20 to 22 April 1959 are discussions with the British government. Again and again, Brandt emphasises that the legal status of Berlin cannot be changed. He decisively rejects accusations from left-wing Labour members of parliament that he wants to risk an atomic war for West Berlin. On 1 May 1959, nearly 600,000 people assemble on the Square of the Republic in front of the Reichstag building to demonstrate against the Soviet Berlin Ultimatum. The rally, organised by the West Berlin Senate, is a signal to the Four Powers, whose foreign ministers will meet ten days later in Geneva, for new negotiations on Germany and Berlin. In his speech, Governing Mayor Willy Brandt makes it clear that the freedom of West Berlin is non-negotiable. Together with fierce attacks against the communist regime in East Berlin, he demands an end to the division of Germany. The Berlin Ultimatum elapses on 30 May 1959 without the Soviet Union and the GDR resorting to any of the measures threatened by Nikita Khrushchev. 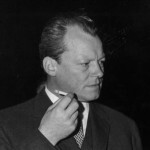 After he met two days previously in Paris with President Charles de Gaulle, Willy Brandt travels on to Geneva on 12 June 1959 to the Four-Powers Conference on Germany and Berlin. In a discussion with the foreign ministers of the USA, Great Britain, France and the Federal Republic of Germany, he warns against all too far-reaching concessions to the Soviet Union. The Governing Mayor does not have a high opinion of the content of a provisional Berlin accord which the three western powers present to the Soviets on 16 June 1959. On 25 June 1959 before the House of Representatives in Berlin, he characterises the western offer as an “outer margin.” The fact that, on 1 July 1959, the Bundesversammlung (federal assembly) is able to meet as planned in West Berlin to elect the Federal President, is a success for Brandt. On 5 July 1959, the party chairman, Erich Ollenhauer, declares that he will no longer run as SPD’s top candidate in the Bundestag elections in 1961. On the recommendation of Herbert Wehner, the party’s executive committee installs a committee to prepare for the election and nominate a candidate for Chancellor. Members of the “Commission of Seven” are the SPD chairman, the Bundestag representatives Carlo Schmid, Fritz Erler and Heinrich Deist as well as Hesse’s prime minister Georg August Zinn, the Mayor of Hamburg, Max Brauer and Berlin’s Governing Mayor Willy Brandt. Schmid is considered the favourite for Chancellor candidate. However, in secret Brandt is already considering this assignment. In the meanwhile, he has become the most popular politician in the Federal Republic, next to Chancellor Adenauer. 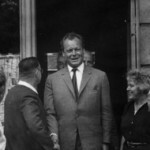 Alerted by the Foreign Office, Willy Brandt interrupts his vacation in the Allgäu and returns to Geneva on 31 July 1959. The reason: At the foreign ministers’ conference of the Four Powers, which has again been meeting since mid-July after a four-week pause, the three western powers have renewed and supplemented their suggestion for a provisional accord on Berlin. However, the federal government and the Berlin Senate express the most serious concerns with respect to a temporary five-year solution. They fear that the Allied rights in Berlin and the presence of western troops in the city could be more strongly challenged by the Soviet Union after the term of the agreement expires. In a discussion with US Secretary of State Herter, Brandt expresses intense scepticism about the western proposal. Therefore, the Governing Mayor reacts with relief when the Geneva Conference ends on 5 August 1959 with no agreement. Before the Berlin House of Representatives on 8 September 1959, he makes no secret of his conviction that no accord is better than a bad one. Since the issue of Berlin has been postponed and the crisis is not over, Brandt pushes even more for a new, realistic foreign and domestic policy for the SPD. In a letter in late August to the deputy party chairman, Waldemar von Knoeringen, he finds nothing good about the SPD’s policy on Germany of March 1959. The concepts of “disengagement” contained in it and its proposal for a confederation between the Federal Republic and the GDR as an initial step for re-unification are considered by Brandt to be illusionary. 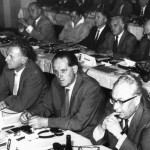 At an extraordinary convention from 13 until 15 November 1959 in Bad Godesberg, with an overwhelming majority, the SPD adopts its new programme of fundamentals which a committee headed by Willi Eichler has formulated. In it the social democrats dedicate themselves to a liberal, democratic socialism which rejects Marxist dogmas. The SPD accepts the principle of the social market economy, affirms the defence of the country and decisively separates itself from communism. With that, the traditional workers’ party transforms itself into a modern national party. 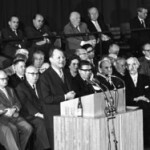 Originally sceptical about the time the programme was adopted, in his address to the convention, Willy Brandt hails the new direction of the SPD, which he has advocated for years. As a member of the executive committee in summer 1959, he participated in the discussions on content and formulation of the new programme. 1. Recognition of the rights of the western powers; 2. Ensuring West Berlin’s belonging to the Federal Republic; 3. No restrictions on free travel to and from Berlin; 4. Consideration for the will of Berlin’s population; 5. Preservation of Berlin as a meeting place for all people. In private, Brandt receives a report from Adenauer on the December 1959 western summit conference in Paris. Since the start of the Berlin Crisis, the two meet regularly for confidential discussions. The “Berliner Morgenpost,” a newspaper from the Axel Springer Publishing Company, publishes on 27 February 1960 excerpts of Willy Brandt’s autobiography, “My Road to Berlin”. The book is published in spring 1960. At the same time as the German edition, translations also appear on the market in the USA, Sweden, Norway, Denmark, the Netherlands, Italy, France and Japan. The journalist Leo Lania ghost-wrote Brandt’s memoires. Brandt confronts the continual personal slanders against him with an extensive depiction of his political path which led him from Lübeck by way of exile in Scandinavia to Berlin. In the press, the 47-year-old’s description of his life is considered to be mainly an application to become the SPD’s candidate for Chancellor. On 12 March 1960, the SPD executive committee in Bonn discusses possible new proposals on Germany and Berlin for the upcoming May 1960 Four-Powers’ summit meeting in Paris. Willy Brandt is convinced that the party must abandon its unilateralism and seek common ground with the Adenauer government. As early as late February 1960, the Governing Mayor spoke out in the Berlin SPD newspaper “Telegraf” for “a common policy on the fateful issues of our nation.” For that he enjoys more and more approval in the SPD, especially from Fritz Erler and Herbert Wehner. On 17 March 1960, Wehner declares the SPD’s 1959 plan for Germany to be over and done with, which, however, Carlo Schmid continues to advocate. Concerning the matter of candidacy for Chancellor, the scale now tips against Schmid and in Brandt’s favour. 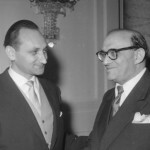 On 1 April 1960, Egon Bahr becomes the new director of the press and information office of Berlin’s Senate and, with that, one of the closest associates of Governing Mayor Willy Brandt in the Senate’s chancellery. The 38-year-old journalist replaces Hans Hirschfeld (SPD), who once served Ernst Reuter in that position. At this time, members of Brandt’s inner circle also include Heinrich Albertz, who has been chief of the Senate’s chancellery since 1959, and Klaus Schütz, a member of the Bundestag since 1957. The long-time senator for federal affairs, Günter Klein, a close friend of the Brandt family, has been up to then the most influential adviser to the Governing Mayor for policy on Berlin and Germany. Soon, however, Bahr will rise to that status. 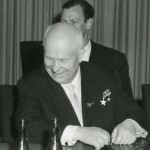 On 16 May 1960, after the shooting down of an American U2 spy plane, Khrushchev surprisingly cancels the summit meeting with Eisenhower, Macmillan and de Gaulle in Paris. At the Four-Powers level, there is no longer a recognisable way to a solution of the German issue. 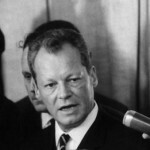 Therefore, Governing Mayor Willy Brandt, in a radio address on 25 May 1960, states that the SPD also will no longer object to the Federal Republic’s membership in NATO. Every government in Bonn must adhere to the treaties with the West. Days before, Brandt and Adenauer demonstrated renewed commonality in their respective Berlin policies. Of course, they do have differing judgements as to the possibility of an interim accord. Previously, the idea of a referendum in West Berlin already provided for differences of opinion. 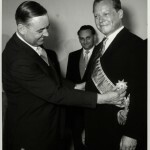 On 15 June 1960, the Norwegian ambassador in the Federal Republic of Germany, Hersleb Vogt, awards the Governing Mayor of Berlin, Willy Brandt, the large cross of the Order of Saint Olav. It is the highest honour which Norway has to bestow. It pays homage to the outstanding devotion which Brandt showed for the freedom of the country during the Second World War. 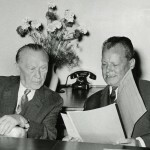 On 6 July 1960, Federal Chancellor Adenauer states behind closed doors in the CDU executive committee: If no one finds anything wrong with Willy Brandt having been a member of the Norwegian Army, then he himself is “appalled (…) by the lack of national and self-esteem of the German people.” According to Adenauer, the CDU must consider measures “for the clarification of facts about Brandt” for the 1961 Bundestag elections. 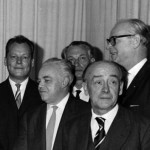 On 11 July 1960, the executive committee and the “Commission of Seven” of the SPD express their support for Willy Brandt as Chancellor candidate in the 1961 Bundestag elections. Two days earlier, over 80 social democrats from the federal states already signalled their support for him. These SPD politicians of the middle generation, who have assembled for a meeting organised by Klaus Schütz in Barsinghausen near Hannover, include, among others, Hans-Jochen Vogel and Helmut Schmidt. But most of all it is Herbert Wehner who smooths Willy Brandt’s path to the candidacy for Chancellor. In his speech in the Bundestag on 30 June 1960, Wehner asserted that integration of the Federal Republic into the West is the foundation of any policy on Germany and its re-unification. Brandt hails this change of course by the SPD which he has long been advocating. On 25 August 1960, without previous announcement, Governing Mayor Willy Brandt visits the SPD regional offices in the East Berlin district of Friedrichshain. Due to Berlin’s Four-Powers status, the party still can be legally active there. However, the social democrats in East Berlin are constantly exposed to increasing repression by the SED regime. Its regional offices on Boxhagener Platz is the last of its kind. With his visit, Brandt, who is also regional chairman of the entire SPD in Berlin, demonstrates his solidarity with his comrades under pressure. When he leaves the offices, a good number of curious on-lookers have assembled there and give him a rousing reception. The day before, the SPD party executive committee in Bonn officially announced that it would enter the 1961 Bundestag elections with Brandt as its candidate for Chancellor. On 24 October 1960, a ceremonial act takes place in Schöneberg Town Hall on the tenth anniversary of the presentation of the liberty bell. It was a gift from American citizens to Berliners and commemorates the time of the Blockade. Since 1950, the bell, which is modelled after the Liberty Bell in Philadelphia, has symbolically called, with its ringing from the tower of the Town Hall, for dedication to freedom and for resistance against tyranny. 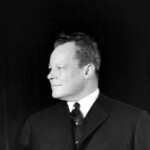 In his address in the House of Representatives, Governing Mayor Willy Brandt thanks the USA as well as all friends of Berlin for their support. As a sign of gratitude for their solidarity in the Cold War, West Berlin has thought of a special gift: Prominent guests from all over the world will receive a miniaturised porcelain copy of the Liberty Bell. 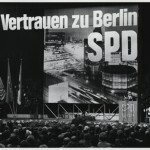 On 22 November 1960, the SPD party convention unanimously selects Berlin’s Governing Mayor, Willy Brandt, as its Chancellor candidate for the 1961 Bundestag elections. In its “Hannover Appeal,” the social democrats dedicate themselves to a new political style. Previously, from 11 until 19 November 1960, he visited Greece, Israel and Italy and while there, was able to speak with, among others, the government leaders Karamanlis, Ben-Gurion and Fanfani as well as with Pope John XXIII. 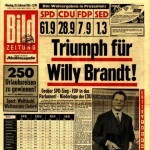 After his nomination as SPD Chancellor candidate, certain substrata of the CDU and CSU attack Willy Brandt personally. The slanders take aim at his exile, heritage, change of name and private life. The leadership of the union parties does nothing to halt the campaign which deeply affects Brandt. On 15 February 1961 in Vilshofen, Franz Josef Strauß (CSU) declares ambiguously that Herr Brandt could be asked one thing: “What did you do in those twelve years out there?” Brandt reacts indignantly, but does however recognise that Strauß spoke out against a “mud-slinging campaign.” But his promise is only a diversionary tactic. Financed by a publisher friend of Strauß close to the CSU, many denigrating articles about Brandt appear in 1961. On 13 March 1961, Berlin’s Governing Mayor, Willy Brandt, is received by John F. Kennedy at the White House in Washington. The new American President is very interested in the SPD Chancellor candidate. The discussion by the two politicians, who like each other quite well, lasts nearly an hour. Blue skies over the Ruhr? On 28 April 1961, at a special congress in Bonn, the SPD passes its government programme for the 1961 Bundestag elections. 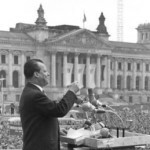 In his speech, Chancellor candidate Willy Brandt promises a new kind of politics. The social democrats intend to grapple with so-called “joint tasks”: health care and treatment, family services and social benefits, construction of dwellings and traffic as well as environmental protection. The SPD plans to increase the minimum vacation time to four weeks by 1965 as well as increase child benefits and pensions. In addition, it intends to take measures for pure air, clean water and less noise pollution. Brandt’s demand that “the skies over the Ruhr District must be blue again” creates a furore, but is dismissed by political opponents and by segments of the media as utopian. In the 1961 Bundestag campaign, the SPD and Willy Brandt try out new methods. His adviser, Klaus Schütz has observed the 1960 US Presidential elections and brings back many ideas which are now used for the first time in the Federal Republic. Therefore, on 7 May 1961, the SPD Chancellor candidate departs on a “tour of Germany” which, modelled on the example of American “canvassing,” attempts to make direct contact with voters. After the Vienna summit conference between Kennedy and Khrushchev on 3/4 June 1961, the fronts on the issue of Berlin are more hardened than ever. The stream of people fleeing the GDR over the open sector borders to West Berlin keeps swelling more and more. On 7 July 1961, to try to prevent the Soviet Union and the GDR from taking unilateral steps, the Governing Mayor of Berlin and SPD candidate for Chancellor, Willy Brandt, proposes a peace conference with all 52 of Germany’s former wartime enemies. However, Chancellor Adenauer rejects this idea. To stem the mass exodus from the GDR, on 13 August 1961, a Sunday, the SED regime seals off the sector borders with the Soviet Union’s approval. The communist authorities order the construction of a wall around West Berlin. Overnight thousands of families are separated. 50,000 East Berliners are shut off from their jobs in the West. The day before Willy Brandt warned in Nuremberg “that the meshes of the Iron Curtain are being cemented.” When he learns of the border closing early in the morning of 13 August, he immediately interrupts his campaign trip and flies to Berlin. But the Governing Mayor can only look helplessly at the barriers. That evening in the House of Representatives, he sharply condemns the eastern measures. 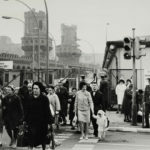 Much to the dismay of West Berliners, other than lodging a protest in Moscow, the West does nothing against the closing of the border imposed by the GDR in Berlin. 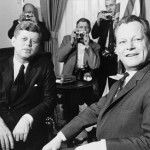 Therefore, Willy Brandt turns directly to John F. Kennedy in a letter dated 15 August 1961. The Governing Mayor requests that the US President not remain passive but do something to counter an imminent crisis of confidence. Kennedy’s reply, which Vice President Lyndon B. Johnson personally delivers on 19 August 1961, is unmistakable: The USA will not intervene in the construction of the Wall, since that would lead to a war with the Soviet Union. But it will guarantee West Berlin’s security. To that end, Kennedy strengthens the US troop presence in West Berlin by 1,500 men who arrive, cheered by crowds, on 20 August 1961. On 17 September 1961, in the Bundestag elections with its Chancellor candidate, Willy Brandt, the SPD receives 36.2% of the votes and with that 4.4% more than in 1957. However, the social democrats fall short of their electoral goal to make forming a government impossible without them. Despite losses for the CDU/CSU, which receive only 45.3%, the 85-year-old Federal Chancellor, Konrad Adenauer, can continue to govern. 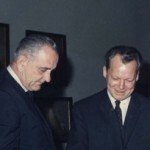 On 6 October 1961 in New York, Willy Brandt receives the freedom prize of the Freedom House. By making this trip, he misses the birth of his son Matthias on the following day. The Governing Mayor writes a memorandum for the federal government on his discussions in the USA and on a telephone call with President Kennedy. According to this, there are “major ambiguities” in American policy concerning Berlin. Brandt does not see a clear definition of Kennedy’s “three essentials” and perceives the ties between West Berlin and the Federal Republic as being in peril. In his opinion, the USA is striving for an accord with the Soviet Union which, along with a settlement on Berlin, would also include a virtual recognition of the Oder-Neisse border and a virtual recognition of the GDR. Brandt insists that Bonn must react to that. On 5 December 1961 in Bonn, Konrad Adenauer informs Willy Brandt about his trip to the USA in November. In Washington, the Chancellor agreed that the Americans and Soviets, for the time being, should conduct negotiations only on Berlin. Brandt considers the exclusion of the German issue to be questionable. The Governing Mayor fears, as he already conveyed in a letter to Adenauer dated 16 November 1961, that the Four-Power status could in future apply only to West Berlin. The Wall, he states, must not be accepted. In negotiations on Berlin, the West must insist at least on the establishment of a limited flow of human traffic between the two parts of the city. In a “Spiegel” interview, which appears on 10 January 1962, Willy Brandt persists with the demand that “the Wall must go!” If that cannot be, then at least attempts must be made to put some holes in the Wall. The Governing Mayor explains that the West Berlin Senate is prepared to speak at the civil servant level with the East Berlin municipal authorities about passes for visits between relatives. A similar offer was sent in late November 1961 by way of the Red Cross and the city commandant to East Berlin – unsuccessfully. The SED polit-bureau insists on direct negotiations between the Senate and the government of the GDR. That, however, is completely out of the question for Brandt. He wants to aid and abet neither an international legal recognition of West Berlin nor an official recognition of the GDR. On his political world tour, the American attorney general, Robert Kennedy, arrives in West Berlin on 22 February 1962 for a three-day visit. The brother of the US President is charged by the latter with gaining an impression of the situation in the divided city. Berliners give Kennedy an enthusiastic reception. Together with Governing Mayor Willy Brandt, the guest from America views the Wall whose brutality leaves him shaken. In Bernauer Straße, the two place a wreath in honour of the first victim of the Wall. At a rally in front of Schöneberg Town Hall, which 100,000 Berliners attend, and in a speech at the Free University, Kennedy repeats American security guarantees for West Berlin. In mid-April, the USA’s latest Berlin proposals trigger the most serious crisis yet in German-American relations. The US administration informed the German government about its plans in strictest confidence. However, they are quickly revealed to the media. President Kennedy is so angered that Bonn’s ambassador in Washington is forced to resign in May. The German side is especially critical of the American idea of an international access authority, in which 13 nations are responsible for watching over free movement to and from Berlin. On 14 April 1962, Willy Brandt communicates the misgivings of the West-Berlin Senate to Foreign Minister Gerhard Schröder (CDU). In an interview with “Welt am Sonntag,” Brandt nevertheless expresses his confidence in the USA. 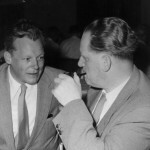 At the SPD’s national convention in Cologne from 26 to 30 May 1962, Willy Brandt and Herbert Wehner are both elected deputies of party chairman, Erich Ollenhauer. From the 335 delegates, Brandt receives 298 votes, Wehner 232. In his speech, the Governing Mayor of Berlin attacks the CDU campaign slogan, “No experiments.” which he sees as the motto for the Adenauer government’s policy of immobility. Brandt asserts that on the international level, the Federal Republic must no longer remain “sitting in the brakeman’s cab,” but rather must finally make its own contribution to easing tensions in close consultation with its allies. Despite his new office in the party structure, he wishes to continue to represent himself in a non-partisan manner, as he states in a letter to Ollenhauer and Wehner in early June 1962. After the construction of the Wall, Governing Mayor Willy Brandt faces major economic problems in West Berlin. Suddenly, the city is short of about 50,000 workers (“border crossers”) from East Berlin and the surrounding countryside. On account of the uncertain situation, moreover, some companies and young, qualified skilled workers leave for West Germany. Therefore, on 29 June 1962, the Bundestag in Bonn passes a new Berlin aid law. Extra-pay for employees (“Zitterprämie” = “trembling premium”) as well as tax credits and investment aid for enterprises reward staying there and encourage immigration. With federal help, Brandt and his Senate are able to overcome the crises. Core areas of investment in West Berlin are housing and municipal construction and construction of cultural landmarks, i.e., the new Philharmonic Hall. In the first year alone after its construction, 24 people die while trying to escape over the Wall. There is major indignation in Berlin, especially after the death of Peter Fechter. The 18-year-old is shot by GDR border guards on 17 August 1962 and remains lying on East Berlin territory. Those in the West see and hear the severely wounded young man. But no one helps Fechter, who bleeds to death. In the following days there are in part violent protests in West Berlin. For the first time, these are also directed at the three protecting powers who are accused of complete inaction. Willy Brandt urgently advises the demonstrators to be prudent. 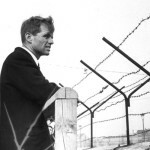 In a radio address on 2 September 1962, he makes it clear that the Wall cannot be removed through violence and that western guarantees are valid for West Berlin only. West Berlin’s Senate has been concerned for months. In July 1962, the American-Soviet discussions on Berlin are finally broken off. Once more the Soviet Union threatens to conclude soon a separate peace treaty with the GDR. Backed by Egon Bahr, Willy Brandt presses for clarification especially on the question of how the West, in this case, will react to an eventual blockade of access routes to Berlin. 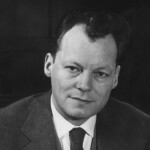 On 2/3 October 1962, Willy Brandt holds two lectures at Harvard University with the title, “Co-existence – the necessity of risk-taking.” As in the 1950s, he argues in favour of a policy of co-existence which furthers a peaceful competition of systems and as many contacts as possible between East and West. Thus, western ideas will be brought to Eastern Europe and communism will be transformed. However, during his USA trip, the discussions conducted by Brandt are dominated by the Berlin Crisis. At the White House, the Governing Mayor speaks on 5 October 1962 with President Kennedy about a possible blockade of access routes to West Berlin and the danger of a Soviet attack. After his return, Brandt informs Federal Chancellor Adenauer about the discussions. On 22 October 1962, President Kennedy announces in a televised address that Soviet missiles are stationed on the island of Cuba. He demands the withdrawal of these weapons targeting the USA and imposes a naval blockade on the Caribbean island. The world is standing on the verge of an atomic war. John F. Kennedy informs Willy Brandt that West Berlin must figure on eastern counter-measures. Nevertheless, the Governing Mayor assures the US President of his full support. In the event of a Soviet attack, Brandt is even prepared to call on the population in the GDR to rebel! 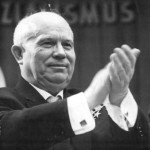 On 28 October 1962, Khrushchev relents. Moscow withdraws the missiles from Cuba. Brandt congratulates Kennedy on this success. The fortunate outcome of the Cuban Missile Crisis is a turning point in the Cold War. 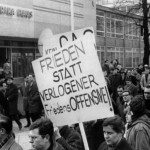 In late October 1962, the arrest of principal staff members of the magazine “Der Spiegel” ignites vigorous protests in the Federal Republic and results in a government crisis in Bonn. 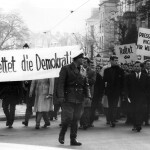 On 19 November 1962, the FDP ends its coalition with the CDU/CSU. In tandem with the SPD, the liberals demand the dismissal of Defence Minister Franz Josef Strauß (CSU), who lied about his role in the affair. When Strauß resigns on 30 November, Herbert Wehner is already conducting secret discussions for a Grand Coalition. Willy Brandt is extremely reserved about the matter. Due to the flu, he only takes part to a very limited extent in the negotiations which in the end lead nowhere. In mid-December 1962, a new edition of the CDU/CSU-FDP coalition under Federal Chancellor Adenauer is formed. 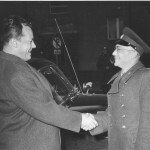 A few days before the visit of the Soviet state and party leader, Nikita Khrushchev, which is scheduled for mid-January in East Berlin, Willy Brandt announces publically his interest in a personal meeting. In fact, Khrushchev invites him to a meeting on the evening of 17 January 1963 in the residence of the Soviet ambassador. 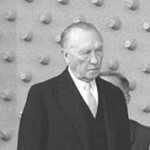 The three Allies and Federal Chancellor Adenauer have nothing against Brandt accepting the invitation. However, as in 1959, the meeting does not take place. Shortly before the scheduled time, the CDU in Berlin threatens the resignation of their senators if the Governing Mayor goes to East Berlin. Since he does not want to meet Khrushchev with a splintered government on his back, Brandt clenches his teeth and withdraws his acceptance of the invitation. 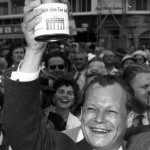 In the election to West Berlin’s House of Representatives on 17 February 1963, the SPD led by Governing Mayor Willy Brandt receives 61.9% of the votes. Its previous coalition partner, the CDU with Franz Amrehn at the helm only makes it to 28.8%. Immediately thereafter, Brandt ends the alliance with the Christian democrats who four weeks ago prevented his planned meeting with Khrushchev. On the occasion of the “Berlin Days of Culture,” Willy Brandt is in Paris for three days starting on 24 April 1963. The Governing Mayor is brought by helicopter to the town of Dizier in Lorraine for discussions with French President Charles de Gaulle. It is the third meeting of the two politicians since 1959 and 1962. De Gaulle shows himself to be open to help mitigate the inhumane effects of the Berlin Wall. He has little sympathy for the Bundestag’s intention to add, at its ratification, a clarifying preamble to the German-French Élysée Treaty that it will not negatively affect the Federal Republic’s trans-Atlantic and European ties. Brandt and the SPD are strongly in favour of the addendum, which has originated at the urging of the USA. For the conclusion of his four-day visit to Germany, John F. Kennedy comes to West Berlin on 26 June 1963. The enthusiastic reception is gigantic. About 1.5 million people line the streets as the US President, Governing Mayor Willy Brandt and Federal Chancellor Konrad Adenauer ride through the city in an open car. After a visit to the Wall, a rally takes place around noon at Schöneberg Town Hall. At this event, Kennedy praises West Berlin’s striving for freedom and will to prevail against communist threats and declares: “Ich bin ein Berliner!” In the afternoon at the Free University, he professes a policy of peace and easing of tensions with the Soviet Union as well. Brandt completely concurs with Kennedy on this policy. By now, both share a great sense of trust in one another. On 15 July 1963, following up on the “strategy for peace“ of US President John F. Kennedy, Willy Brandt sketches the main points of a new policy towards the East and on Germany in a speech in Tutzing. As in October 1962 at Harvard, he advocates the easing of tensions between the East and West. Above all, Brandt argues in favour of a new relationship between the Federal Republic and the Soviet Union, because the German issue cannot be solved without Moscow. The biggest furore is caused meanwhile by the slogan “change through rapprochement” with which Senate press speaker Egon Bahr calls for negotiations with the communist regime in the GDR. His contribution ignites a heated controversy. Despite misgivings against Bahr’s proposal, the Governing Mayor tries to shield his closest advisor from criticism. Five days before his departure as Chancellor, Konrad Adenauer is awarded honorary Berlin citizenship. On 10 October 1963, at a festive occasion in Schöneberg Town Hall, Governing Mayor Willy Brandt recognises the achievements of the 86-year-old in establishing the Federal Republic of Germany. In particular, he thanks Adenauer for always having had an ear open to the needs of the city. The tensions that existed between the two, immediately after the construction of the Wall, are not hushed up by Brandt. To that, the outgoing head of government replies glibly: “Allusions to conflicts have been made here – I no longer know a thing about conflicts.” After 14 years in office, Adenauer resigns on 15 October 1963. One day later the Bundestag elects Ludwig Erhard (CDU) as the new Federal Chancellor. Having just returned from a 2½-week trip to Africa, Willy Brandt learns on the evening of 22 November 1963 of the murder of John F. Kennedy. Around midnight, 50,000 West Berliners spontaneously assemble in front of Schöneberg Town Hall. In a speech, Brandt says: “We in Berlin are in mourning especially because we have lost our best friend.” Not long afterward, the place where the US President made his famous speech on 26 June 1963 is re-named John F. Kennedy Square. 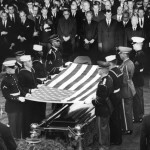 On 25 November 1963, Brandt attends the funeral ceremonies in Washington. As a friend of the family, the Governing Mayor is also invited for a conversation with the widow, Jacqueline Kennedy, and the President’s brother, Robert Kennedy. In 1964, Brandt publishes a book on his ”Meetings with Kennedy”. On 17 December 1963, after difficult negotiations, the authorised representatives of the West Berlin Senate and the GDR government sign an accord on travel passes. As a result, West Berliners can visit relatives in East Berlin for the first time since the construction of the Wall. 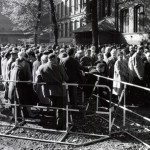 A total of 730,000 people take advantage of the regulation, which is valid until 5 January 1964. Willy Brandt, who celebrates his 50th birthday on 18 December 1963, is very happy about the large number of human contacts in the divided city. The accord, concluded with the agreement of the Allies and the federal government, is the first success of his “policy of small steps,” which is supposed to render the Wall more penetrable. Responding to criticism arising in Bonn and Berlin, the Governing Mayor asserts that the arrangement does not signify recognition of the GDR. 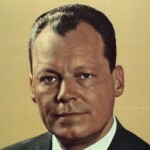 At an extraordinary party convention in Bad Godesberg, Willy Brandt is elected on 16 February 1964 as SPD chairman to succeed Erich Ollenhauer, who died two months previously. He receives 320 of 330 votes and is also nominated once more as Chancellor candidate. The posts of deputy to the new chairman are filled by Herbert Wehner and Fritz Erler, who also assumes leadership of the SPD fraction in the Bundestag. Willy Brandt made himself available for the party chairmanship only on the condition that he does not have to give up his position as Governing Mayor of Berlin. He sees good prospects for the SPD to win the 1965 Bundestag elections, as Brandt states in an interview with the Bonner General-Anzeiger in mid-March 1964. In spring 1964, the Brandts move from Marinesteig 14, where they have lived since late 1955, into a house obtained by the Senate on Taubertstraße 19 in Berlin-Grunewald. In addition to the parents and the three sons, a toy poodle and a Siamese cat are also part of the family. The Governing Mayor pays more than 700 deutschmark in monthly rent for the roomy villa with 6 bedrooms. Located on its park-like property of 7,000 square metres are also the Senate’s guest house and a swimming pool. Right after this, critics accuse Brandt of questioning the trans-Atlantic partnership. In his discussions with President Lyndon B. Johnson and Secretary of State Dean Rusk, Brandt makes it clear what he is really about: The Federal Republic should finally show more initiative of its own toward easing tensions with Eastern European nations. In August 1964, Willy Brandt sends the memorandum, “On relationships with Eastern European nations and peoples,” to US Secretary of State Dean Rusk as well as to political friends at home and abroad. During his USA visit in May 1964, Rusk asked him for such an elaboration. The memorandum, prepared in co-ordination with Herbert Wehner and Fritz Erler, sees chances for promoting the efforts of Eastern Europeans for more autonomy from the Soviet Union. As many ties as possible between Western and Eastern Europe should be created through cooperative projects in economics and culture. When the CDU/CSU in Bonn learn about the confidential paper, they accuse the Governing Mayor of going his own way in foreign policy. 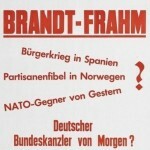 Angered by the criticism, Brandt has the memorandum published in January 1965. Following months of negotiations, the government representatives of the West Berlin Senate and the GDR, Senate Councillor Horst Korber and State Secretary Erich Wendt, reach an agreement on 24 September 1964 for a further accord on travel passes. This second travel-pass accord makes it possible for West Berliners to visit relatives in East Berlin from 30 October to 12 November 1964, from 19 December 1964 to 3 January 1965 as well as over Easter and Pentecost 1965. In addition, it is agreed that starting on 1 October 1964, applications for visits due to urgent family matters will be processed preferentially. Willy Brandt strongly regrets that a lengthy interruption of the discussions occurred starting in late February 1964, not least of all due to major reservations about the first accord by Federal Chancellor Ludwig Erhard. The SPD party convention, which meets in Karlsruhe from 23 to 27 November 1964, confirms Willy Brandt as chairman with 314 of 324 votes. The Chancellor candidate gives as the party’s goal for the 1965 Bundestag election: The SPD should become the strongest party and head a government. Responsible positions in Brandt’s high-level team are held by Fritz Erler for foreign policy, Karl Schiller for economics, Helmut Schmidt for defence and Herbert Wehner for pan-German issues. Also, prominent intellectuals such as Hans Werner Richter and Günter Grass are guests at the party convention. However, the stage setting presents the effect of looking backwards: Under the motto, “Heritage and Mission,” they show a portrait of Kurt Schumacher and a profile map of Germany in the borders of 1937, that is, with the territories east of the Oder and Neisse rivers. 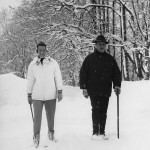 In late January 1965, Willy Brandt goes to Wildbad Kreuth on Lake Tegern for a three-week therapeutic stay. This time out from political activities does not mean, however, that the Governing Mayor of Berlin and SPD chairman would not also work some during his stay. In a letter to Mayor Heinrich Albertz dated 13 February 1965, for example, Brandt gives detailed instructions to Berlin’s Senate chancellery. As the 51-year-old admits in August 1965 in an interview with the news magazine “Der Spiegel,” as a result of his stay at the health resort, he is limiting his consumption of alcohol and no longer drinks “the hard stuff.” According to his own attestation, Brandt also smokes less since his switch to cigarillos. Of course, his wife Rut thinks he still smokes too much. 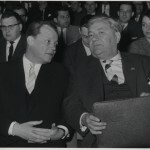 Accompanied by Fritz Erler, the chairman of the SPD fraction in the Bundestag, Berlin’s Governing Mayor, Willy Brandt, visits the USA for ten days. 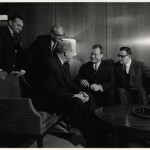 They speak with President Lyndon B. Johnson, Secretary of State Dean Rusk, defence minister Robert McNamara and other US politicians on subjects such as the situation in Berlin, initiatives on the issue of Germany, relations with France and NATO’s planned Multilateral Atomic Security Force (MLF). Taking stock of the visit, which he does as party chairman and Chancellor candidate of the SPD, Brandt stresses his high degree of agreement with the US government. He calls on Europe and Germany to have more understanding for its policy in Vietnam. On 19 April 1965, the “New School of Social Work” in New York awards Brandt an honorary doctorate. From 18 to 28 May 1965, during her first visit to Germany, Queen Elizabeth II also comes to Berlin. 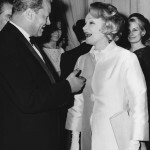 On 27 May, she is welcomed by Governing Mayor Willy Brandt. Berliners give the monarch a similarly enthusiastic reception as for John F. Kennedy only two years previously. The Queen inspects the British morning parade on the Maifeld behind the Olympic Stadium, inspects the Wall at Potsdam Plaza, plants a tree in Tiergarten Park and signs the city’s Golden Book at Schöneberg Town Hall. Together with Brandt and Chancellor Ludwig Erhard, the Queen takes lunch in the Orangerie of Charlottenburg Palace, before she leaves Berlin for Hannover. On a three-day visit to Paris, Willy Brandt once again meets with French President Charles de Gaulle. Subjects of their discussions are, next to German-French relations and the status of European integration, also the relationship to Eastern Europe and to the Soviet Union as well as NATO and their concepts concerning security. France’s President does not care at all for the Federal Republic having a right to co-determination in the atomic defence of the Atlantic Alliance. On the issue of Germany, de Gaulle states quite plainly that there will be no chance of a re-unification if the borders with Czechoslovakia and Poland are not recognised. 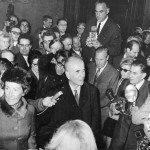 In the following days, Brandt conducts additional discussions with Prime Minister Georges Pompidou and Foreign Minister Maurice Couve de Murville. As four years previously, Willy Brandt again goes on a “trip through Germany” during the 1965 Bundestag election campaign to come in contact with the people. By car and by special train, the SPD Chancellor candidate puts around 50,000 kilometres behind him. “Better safe than sorry” is the social democrats’ slogan whose election programme is presented by Brandt at a meeting in Dortmund on 14 August 1965. However, his appeal for a business-like election campaign falls on deaf ears. In the election to the 5th German Bundestag on 19 September 1965, Chancellor candidate Willy Brandt clearly falls short of his self-declared goals. Indeed, the SPD improves its showing up to 39.3%, but that is by far not good enough for first place. The CDU/CSU remains the strongest fraction, reaching 47.6% with Chancellor Ludwig Erhard. The FDP achieves 9.5% of the vote and again becomes the coalition partner with the Union parties. Disappointed by this defeat and deeply affected by the personal slanders in the election campaign, Brandt declares three days after the election that he will no longer be available as Chancellor candidate. He also turns down his Bundestag mandate in Bonn. For a while it seems that he has even considered withdrawing completely from politics. But Brandt continues as SPD chairman and as Governing Mayor of Berlin. On 25 November 1965, the negotiators of the Berlin Senate and the GDR government, Senate Councillor Horst Korber and State Secretary Michael Kohl, sign the third accord on travel passes. On application, West Berliners can visit relatives in East Berlin in the time period of 18 December 1965 until 2 January 1966. In addition, visits on urgent family matters are possible from 29 December 1965 until 31 March 1966. For Governing Mayor Willy Brandt, the new agreement is “no occasion for cheering.” He promises to try for better accords, but warns also against wishful thinking. One of the principal causes of annoyance for West Berliners is the fact that the GDR, since 1 December 1964, has forced day visitors from the West to exchange three deutschmark into east marks at an artificial exchange rate of one to one. On 5 February 1966, around 200 students demonstrate in front of the America House in West Berlin against the bombardment of North Vietnam by the US Air Force. The demonstrators block access to the building with a sit-down strike, throw eggs at the façade and try to tear down the American flag. In a press release, Willy Brandt sharply condemns the protest. The Governing Mayor sees Berlin’s reputation in jeopardy and accuses the students of besmirching German-American friendship. Brandt expresses no criticism of America’s actions in Vietnam even to President Johnson, whom he meets in Washington on 23 February 1966. Of course, he does learn on this trip that the debate over the war in the USA has already become highly controversial. The fourth travel pass accord which is concluded on 7 March 1966 between the West Berlin Senate and the GDR government, is in effect for Easter and Pentecost 1966. In this time period, West Berliners can again visit relatives in East Berlin. However, it is the last agreement of this nature. Additional negotiations fail, because the SED regime rejects any further agreements as long as the GDR is denied official recognition and West Berlin is not treated as an independent political unit. The fact that the Federal Republic still does not accept the existence of the East German state is also evident in the “peace note” which the Bundestag adopts unanimously on 25 March 1966. In it, for the first time, Bonn offers the Soviet Union and the Eastern European nations, but not the GDR, an exchange of declarations renouncing military force. 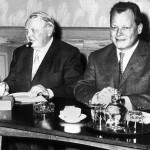 On 8 May 1966, Willy Brandt meets for the first time with the Soviet ambassador in the GDR, Piotr Abrassimov. The discussion which the two conduct at a reception by the Swedish consul general in West Berlin, Sven Backlund, revolves around German-Soviet relations and issues concerning Berlin. After further meetings on 6 June and on 29 September, the Governing Mayor accepts Abrassimov’s invitation to East Berlin. 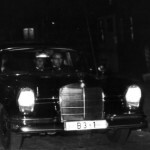 On 12 October 1966, he travels, accompanied by his wife, Rut, to a dinner at the Soviet embassy on Unter den Linden Avenue. A fifth meeting occurs on 22 November 1966 in Berlin. Brandt wants an easing of tensions with the Soviet Union. 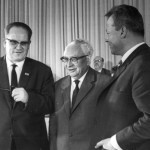 As early as March 1966, he spoke for the first time as well with Moscow’s ambassador in Bonn, Andrei Smirnov. On 29 June 1966, following months of give and take carried out through open letters, the leadership of the SED in East Berlin calls off an exchange of speakers with the SPD planned for July. Consequently, a public appearance by Willy Brandt, Fritz Erler and Herbert Wehner in Chemnitz (called Karl-Marx-Stadt back then) and an event with SED functionaries in Hannover are both cancelled. As a pretence for the cancellation, the SED refers to a law by the Bundestag stating that the speakers from the GDR entering the Federal Republic would temporarily not be subject to criminal prosecution. Despite this, the SPD executive committee intends to pursue efforts for an open exchange of ideas with the GDR’s national party. The party convention also commits itself to that end in early June 1966 in Dortmund, where Brandt is confirmed almost unanimously as SPD party chairman. When his 20-year prison sentence is completed, Albert Speer, Hitler’s architect and minister of armaments, is released from the Allied War Criminals Prison in Berlin-Spandau. For this occasion, on 29 September 1966, Willy Brandt sends by courier a bouquet of flowers to Hilde Schramm, Speer’s daughter living in Berlin. Since 1962, the Governing Mayor has supported the ultimately vain efforts by Schramm to have her father released early. Since reporters are camped out at the woman’s apartment, the bouquet of flowers becomes public knowledge. In the press, the gesture meets with incredulity and criticism among people persecuted by the Nazis and in the SPD, which takes Brandt by surprise. At the request of the chairman of the Jewish Community, Heinz Galinski, he has to cancel his participation on 9 November 1966 in a memorial ceremony on pogroms. Willy Brandt is at home when, on 23 October 1966, a Sunday, he suddenly suffers a seizure. The 52-year-old has chest pains, cannot inhale and believes he is suffocating. It is Roemheld Syndrome: An accumulation of air in the gastrointestinal tract is pressing on the diaphragm and on the heart as well. Medically, the matter is over with quickly. But the feeling of having looked death in the eye, changes Brandt’s attitude about life. His book, “Out There – Writings during Emigration”, which appears in the same month, also represents another turning point. Brandt goes on the offensive against the slanders which had affected him so negatively during the 1965 Bundestag campaign: What he put on paper during his exile is presentable, and none of it has to be explained away, he asserts quite confidently. Due to an economic crisis, the coalition of the Union parties CDU/CSU with the FDP falls apart in autumn 1966. After Federal Chancellor Ludwig Erhard (CDU) expresses his willingness to resign and the CDU/CSU Bundestag fraction elects Kurt Georg Kiesinger as its Chancellor candidate, negotiations for a new government begin in mid-November 1966. On 27 November 1966, the delegations of CDU/CSU and SPD agree on a Grand Coalition. Previously, each one’s discussions with the FDP has failed. 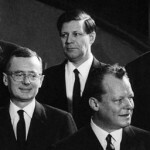 After a ten-hour debate, the chief committees of the SPD agree on the new coalition early on the morning of 29 November 1966. 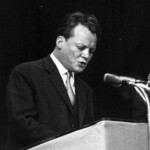 In this meeting, as well as in an exchange of letters with Günter Grass and in a letter to SPD members, the party chairman, Willy Brandt, defends his party’s participation in the government against heated criticism. On 1 December 1966, the Bundestag elects Kurt Georg Kiesinger (CDU) as the new Federal Chancellor. On the same day, cabinet members are named and sworn in. Willy Brandt becomes the Foreign Minister and Vice Chancellor. Quite open-mindedly, he meets the mostly conservative associates of the Federal Foreign Office (AA). Brandt outlines the foreign-policy goals of the Grand Coalition thusly: “Preserve the rights of our people, build up Europe, and guarantee peace through easing of tensions without illusions.” His first trip abroad as foreign minister takes him to Paris in mid-December. The Brandt family moves into a service villa on Kiefernweg 12 on the Venusberg in Bonn. Only their son, Peter, remains in Berlin. Egon Bahr and Klaus Schütz accompany Willy Brandt to the Foreign Office. Heinrich Albertz (SPD) becomes the new Governing Mayor.